Herbs & Veggies & Flowers, Oh My! 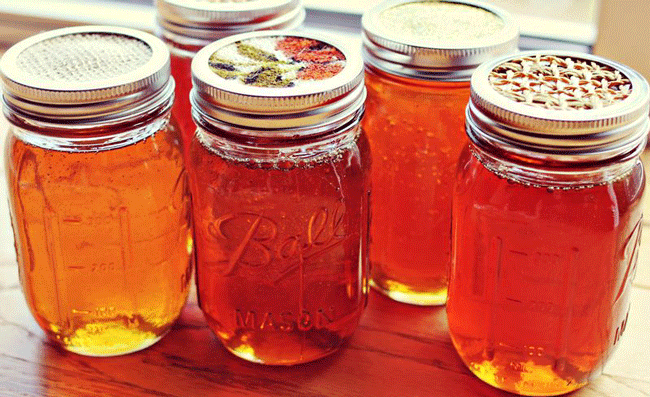 Some For You, Some For the Bees. 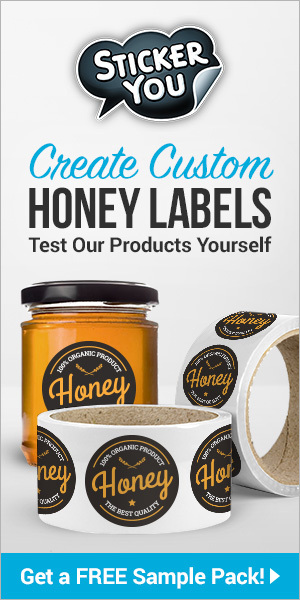 Herbs have been grown for honey bee forage for millennia, ever since ancient Greeks and Romans learned the fine art of beekeeping. In Book IV of the “Georgics” (29 BC), Virgil recommends the ideal spot for an apiary. 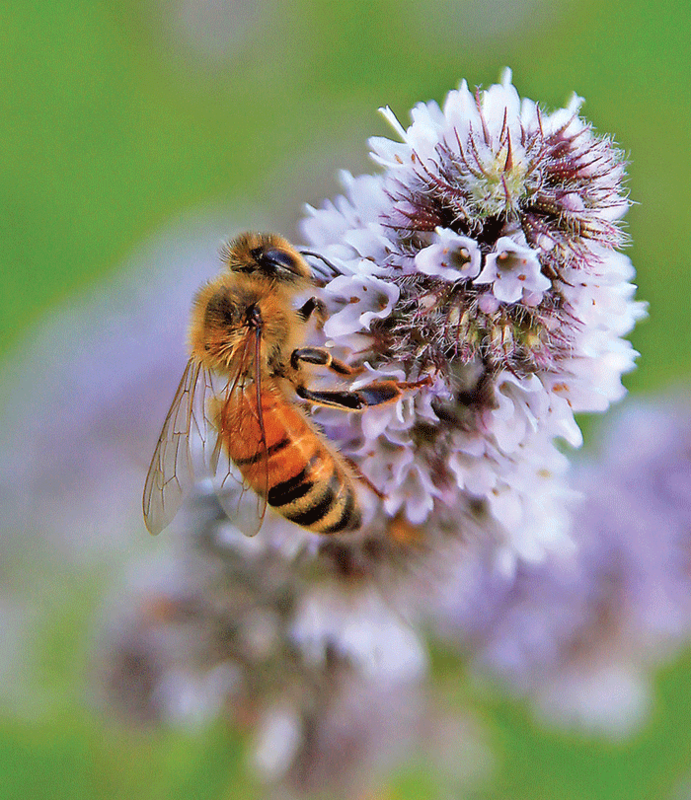 Today, gardeners know how attractive a herb garden can be to honey bees, with even more choices of culinary or medicinal herbs to grow for nectar and/or pollen. 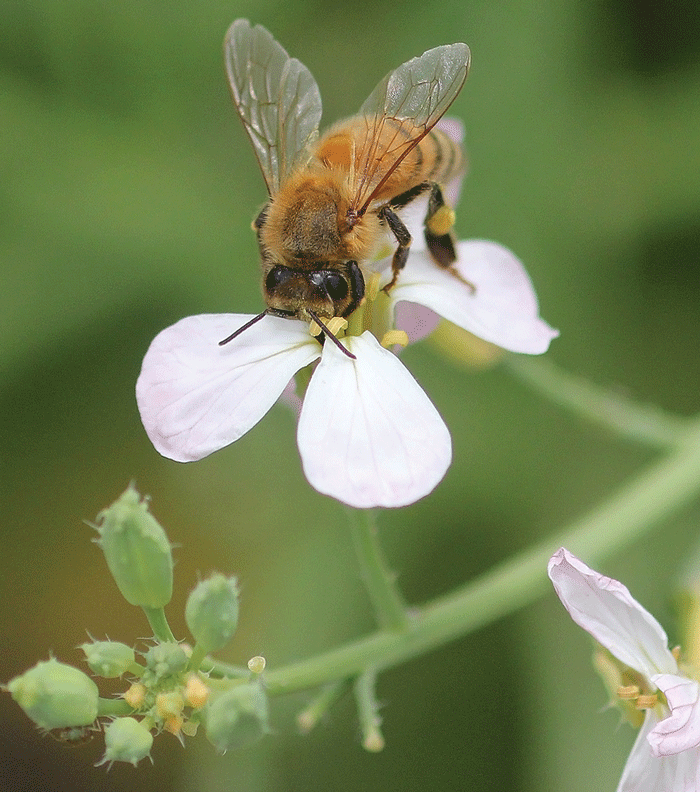 Similarly, certain plants grown for their edible leaves, stems or roots also bear flowers that bees love. In vegetable terms, this is sometimes called “bolting”, an old English word used to describe how a plant grown for its vegetative parts ultimately flowers and produce seeds. Though bolting might not be every vegetable gardener’s objective, the bees will appreciate you for it. So if you have a veggie patch or herb garden, consider letting some of these edible plants flower. In fact, why not grow some for you and some just for the bees? 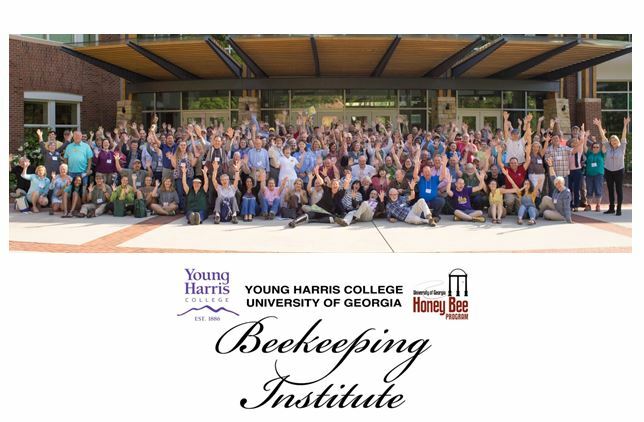 And, of course, remember that you need lots of one type of plant to encourage scout bees to add your garden to the colony’s foraging map – one little dill or mint plant is not going to work. Seasoned asparagus gardeners know that once you’ve harvested the thick spring shoots from your mature (three years+) asparagus patch, it’s important to let the thinner spears, stems and leaves keep growing to photosynthesize and nourish this perennial so it thrives. Honey bees are very fond of the bright orange pollen on the tiny, yellow male flowers and perform elegant acrobatics in order to harvest it. This aromatic annual has seen its popularity as a container annual soar, not just for the traditional Indian ‘tulsi’ tea made from its aromatic leaves, but for the long-blooming spikes of purple flowers that are irresistible to all kinds of bees, including bumble bees, tiny sweat bees and, of course, honey bees. Sacred basil likes rich soil and needs at least four hours of sun to thrive, but will take some afternoon shade. Pinch the stems to encourage bushiness and watch the bees come. 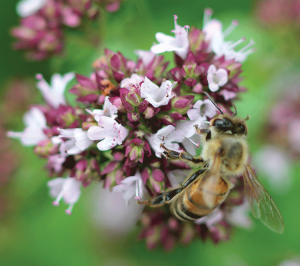 Basil, sweet (Ocimum basilicum) – Tiny, white sweet basil flowers can be used in recipes just like the leaves, but if you snip them you’ll be depriving honey bees of a taste treat. Sweet basil likes rich, adequately moist soil and prefers some shade from hot sun in mid-afternoon. (Another popular culinary basil, African blue basil is a cross between two Ocimum species and is also very popular with honey bees). 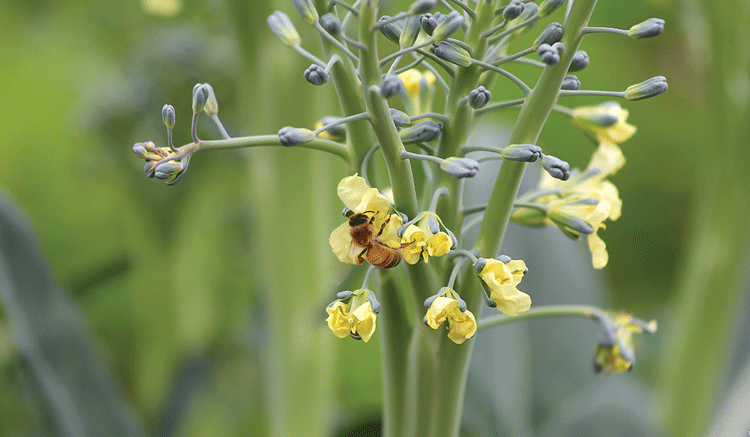 It shouldn’t be a surprise that letting your broccoli, kale or Swiss chard plants go to flower is a good way to nourish honey bees, since related Brassica crops like mustard and canola (rapeseed) are often pollinated by bees managed by commercial hive operators (though canola honey is fast to crystallize, thus often turned into cremed honey). 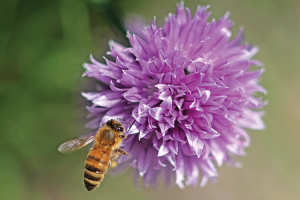 Not only do perennial chive flowers look lovely in the garden and in bouquets, they’re also a boon for honey bees and bumble bees– and you can still snip the leaves for your smoked salmon bagel or baked potatoes. 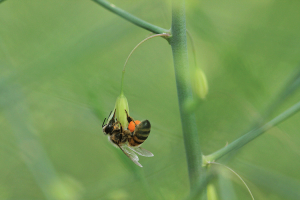 Honey bees also enjoy the white flowers of garlic chives (Allium tuberosum) which is often planted as an ornamental perennial. 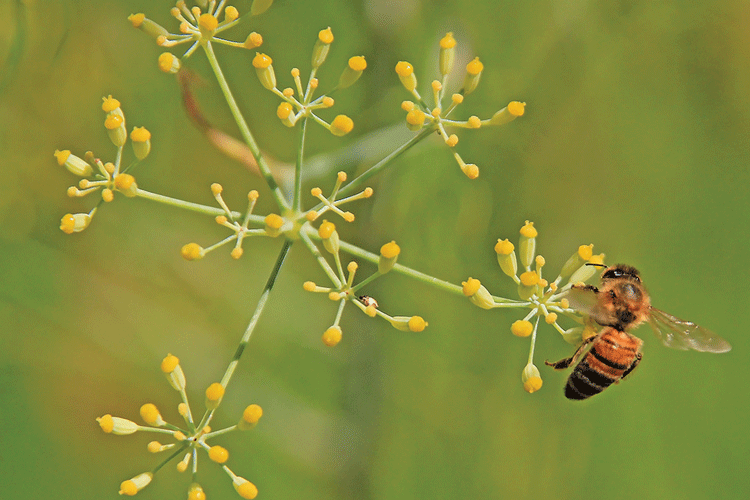 Did you know that in parts of Italy, they make a honey from dill? 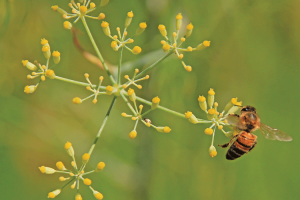 While you might prefer dill pickles to dill honey (amber to brown and quick to crystallize), letting your dill plants flower will keep honey bees happy. And those airy, yellow dill blossoms look divine when planted amidst colorful Summer annuals like bee-friendly single zinnias! An excellent, hardy perennial herb with umbels of tiny white or pink flowers that literally buzz with bees in mid-Summer, oregano is easy to grow in regular soil in a sunny spot. Like other brassicas, common (annual) radish is very attractive to honey bees, but bumble bees and natives seek out the open, easily accessible flowers too. Flowers form after the roots reach an edible size, in response to warm summer temperatures. Rosemary (Rosmarinus officinale) – Another good shrubby herb that honey bees adore, rosemary prefers sunny, relatively dry conditions that mirror its native Mediterranean habitat. In milder parts of North America, it will overwinter and become quite large, depending on the variety. In Italy, honey bees that forage rosemary crops yield a honey called “miele di rosmarino”. Sage (Salvia officinale) – All sages attract honey bees, including European meadow sage (S. nemorosa), California black sage (S. mellifera) and bee sage (S. apiana), but common sage has been popular with beekeepers since medieval apothecaries kept it in the “officina” or herb storeroom to be used to “salve” or heal various ailments. The light purple flowers with crimson calyxes are beautiful, and are very attractive to bees. 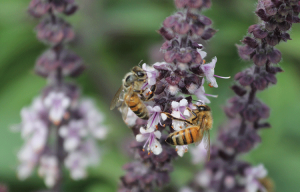 Unsurprisingly, beekeepers in the Abruzzo region of Italy make a monofloral honey from common sage flowers called “miele di salvia”. Common thyme is another ancient southern European herb grown for its aromatic leaves and mats of purplish-pink flowers. A hardy perennial, it’s often seen in sunny, dry spots in gardens in a lush, fragrant carpet growing between paving stones. 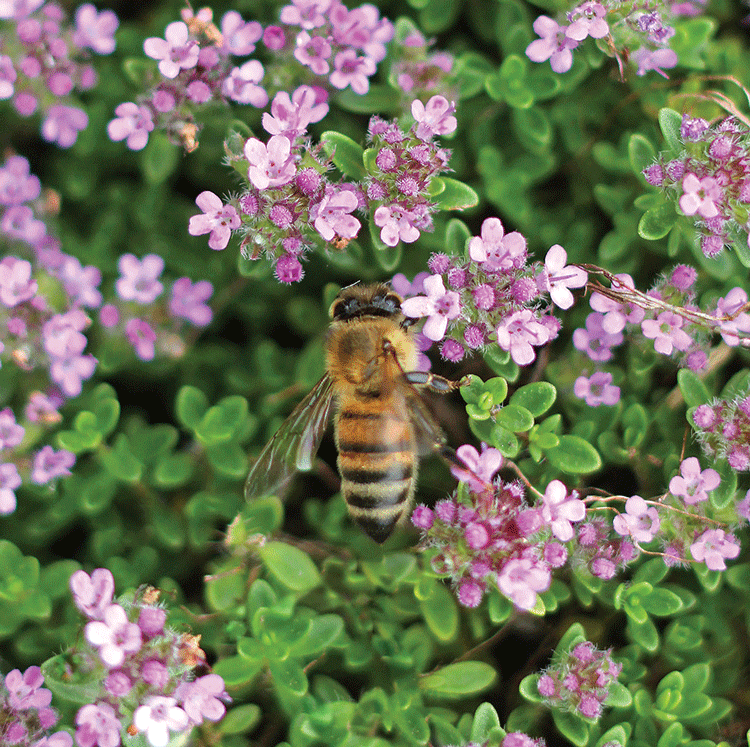 A more tender Greek plant, wild thyme (T. capitatus), growing on Mount Hymettus near Athens, yields the iconic Hymettus honey, which Greeks typically use to sweeten yogurt. In Midsummer Night’s Dream, Shakespeare’s Oberon, king of the “faeries” said: “I know a bank where the wild thyme grows”. If he’d looked closer, he might have seen honey bees nectaring in those tiny blossoms.